PEZ hit the height of its American popularity in the '80s and '90s, but this dispensable candy is much older than that. These small, sugar candies have a longer history than you might know. 1. PEZ WERE ORIGINALLY ANTI-SMOKING MINTS. Austrian inventor and businessman Eduard Haas III came up with the idea for PEZ in 1927. Haas came from a wealthy family of doctors and retailers, and as an anti-smoking advocate, he decided the small mints could help those trying to kick cigarettes. The 30-year-old Haas hired a chemist to perfect a cold-press process that would quickly and cheaply compress peppermint oil and sugar into peppermints. As for the now recognizable name, the mints were named for the German spelling of peppermint—"pfefferminz"—nabbing three letters to make PEZ. 2. THE FIRST PEZ WERE ROUND. It took some time for Haas to figure out the best way to produce and package his PEZ mints. The first versions were called PEZ Drops, and were round candies wrapped in rolls. But, Haas soon determined that packaging the round candies was a pain, so he and his chemist partner sought out a new shape: the rectangular PEZ. The new shape was easy for machines to wrap, and helped keep PEZ production inexpensive. By the 1930s, PEZ appeared in metal tins that could easily be tucked into coat pockets or purses. Actual dispensers for Haas’ cessation mint wouldn’t be seen until after World War II. 3. VINTAGE PEZ ADS WERE RACY. Because PEZ was originally intended to help adult smokers kick the habit, its advertisements targeted an older demographic. And to do that, they featured bosomy pinup girls hawking mints. At the same time, PEZ were marketed as an edible for the elite, called "the mint of the noble society," and as an anti-smoking tool ("Smoking prohibited—PEZing allowed!"). By the time PEZ made their way to the United States in the 1950s, the pinup ads were dropped for more child-friendly marketing. 4. AN EASY-TO-USE DISPENSER WAS A BIG COMPANY GOAL. 5. PEZ DIDN'T APPEAR IN THE U.S. UNTIL THE 1950S. In 1953, PEZ took a chance in American markets, though it initially didn’t find much interest. The peppermint flavor didn’t stand out, pushing Haas Food Manufacturing to rethink its mint. PEZ tablets were retooled with fruit flavors and new packaging to appeal to an entirely different audience: children. 6. DISPENSERS FOR KIDS BECAME A BIG HIT. As part of PEZ marketing in the U.S., Haas realized that making the candy dispensers into toys could boost sales. The first child-oriented dispensers came in three shapes: a full-bodied Santa Claus, a full-bodied robot and a space gun (which shot candy out of the muzzle). In 1962, PEZ entered a new level of dispenser marketing by pairing with Walt Disney Studios. Even with fierce competition from Mickey Mouse, PEZ’s Santa dispenser (released in 1955) remains a top-selling dispenser. Because of the toy and candy combination, PEZ is considered the first interactive candy, and has more than 1500 different dispensers. 7. MAKING PEZ IS A HIGH-PRESSURE JOB. That’s because the raw ingredients in PEZ candy undergo 3000 pounds of pressure to become the tiny tablets. Every package of PEZ has only 12 candies, which explains why they seems to disappear so quickly. PEZ dispensers are made in China, Slovenia and Austria, then shipped to the world’s only PEZ candy factory in Orange, Conn. There, candy and toy dispensers are paired up and packaged. 8. EVER WANTED TO TASTE PLANT-FLAVORED PEZ? At one point in time, it was possible, because PEZ offered chlorophyll-flavored candies. 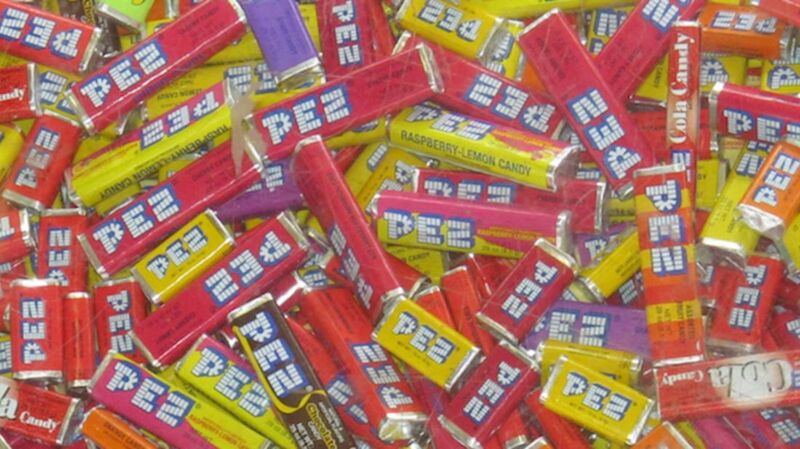 Other specialty PEZ flavors have included licorice, coffee, cola and pineapple. And peppermint PEZ has also made a comeback. Since PEZ is sold in 60 countries, flavors can vary; popular peach isn’t available in the U.S.
9. REAL PEOPLE HAVE BECOME PEZ DISPENSERS. PEZ often features fictional characters and animals on its dispensers, which has led to the belief that real people can’t appear on the collectible dispensers. Not true! Contrary to popular belief, several real-life people have graced the tops of PEZ poppers. In 1976, Betsy Ross, Paul Revere and Daniel Boone were on Bicentennial Commemorative PEZ dispensers; several U.S. presidents have been featured, as well as the members of KISS. Still, the selection of real people PEZ dispensers isn’t large because the company is selective; recent requests for Kim Kardashian and personalized dispensers just aren’t happening. 10. PEZ COLLECTION MANIA DIDN'T START UNTIL THE 1990s. While PEZ were popular among Baby Boomer children and '80s kids, it wasn’t until the 1990s that dispenser collecting became big business. PEZheads (the self-proclaimed title for PEZ collectors) created a collecting frenzy where prices for vintage dispensers skyrocketed. During the PEZ rush in 1994, dealer John Devlin said that PEZ prior to the '90s were traded like baseball cards instead of being sold. “People used to say, ‘I’ll give you two dispensers for your one.’” Vintage PEZ dispenser prices skyrocketed, and some collectors even created counterfeits to cash in on the trend. Who knew a small mint meant for smokers could become a national craze?